With the Fire Fall LC, VICTAS presents a new member of the Fire Fall family. The 7-ply structure of this offensive blade is based on the popular Fire Fall SC. Thanks to the new, even lighter and faster synthetic Line Carbon fiber, the overall weight of the blade is just about 85g. The Fire Fall LC combines perfectly balanced playing features, light weight and great speed. 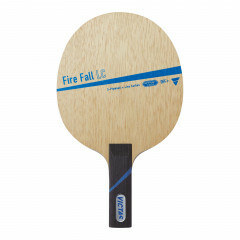 The Fire Fall LC is the first choice of any technically skilled offensive player who rely on modern attacking and put pressure on their opponents with dangerous topspin play. Victas Blade Fire Fall LC is beeing added to cart.